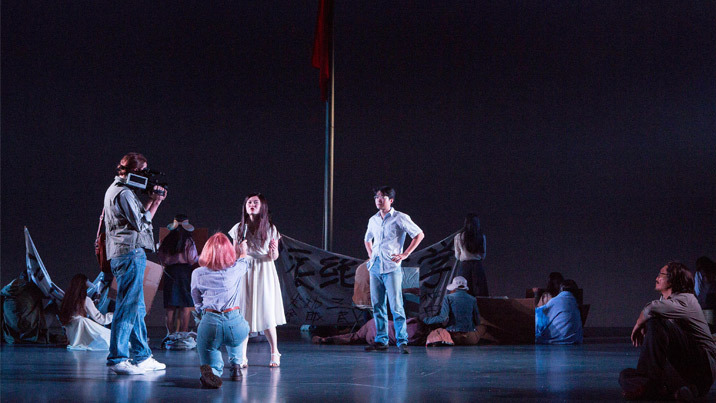 In Children of the Sun , STC Resident Director Kip Williams directed Andrew Upton's adaptation of the Maxim Gorky original. Renée designed the stunning and enormous collection of period costumes that clothed the ensemble of characters over the course of one very busy weekend in pre-Revolutionary Russia. Zooming in on one costume in particular, let's look back at the character of Melaniya (played by the indefatigable Helen Thomson, soon to be seen in After Dinner). 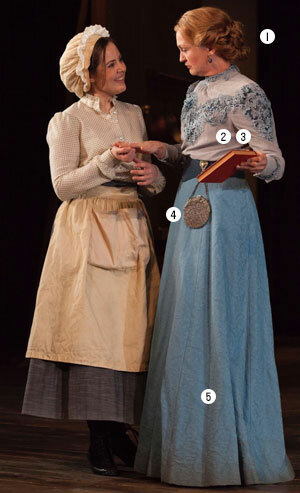 In the photo, Melaniya (in blue) is having a chat with upstart maid Feema (Contessa Treffone). Starting at the top with the hair... a wig was custom-made by Kylie Clarke Wigs and styled by our regular Wig, Make-Up & Wardrobe Supervisor Lauren A. Proietti. It was washed and restyled every day because raw eggs were cracked over Melaniya's head during Act II. Melaniya's blouse was constructed from silver grey silk, with its lace detail applied by hand. The lace was bought in but was dipped blue (from its original white) by art finisher Steven Vella and then cut into shape before being applied. The corset, petticoat and boots were all sourced from STC's existing stock of costumes. Melaniya's Victorian-style (circa late 1800s) coin purse and belt clip, with steel beads and doeskin, was sourced online from an antique dealer in San Francisco. For the blue belt and skirt, upholstery weight cotton was sourced. 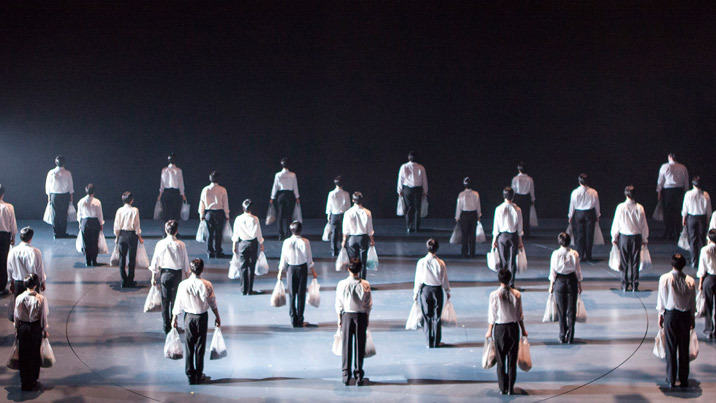 Finally, the whole thing was made twice by Costumiers Ruth Tickle and Suzannah McCrae. The Act II egg fight meant plenty of time for cleaning was needed (too long for a day when there was both a matinee and evening performance). 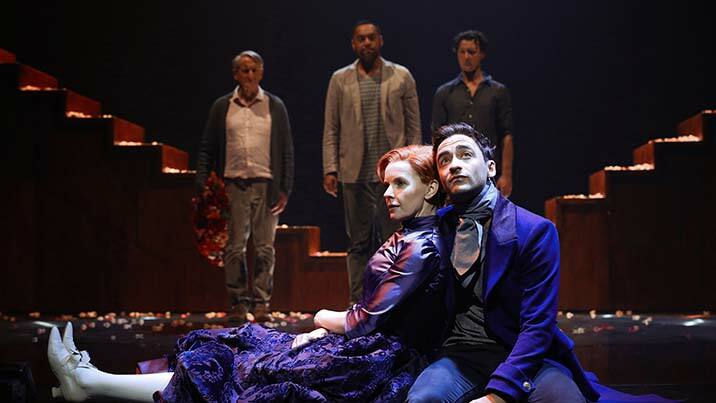 In the above photo from Children of the Sun, Jacqueline Mackenzie, Justine Clarke, Valerie Bader, Julia Ohannessian, Toby Truslove, Jay Laga'aia and James Bell look on as Yure Covich threatens Chris Ryan with a spade. Below, Justine Clarke holds court with Hamish Michael, Jacqueline MacKenzie, Toby Truslove and Chris Ryan. 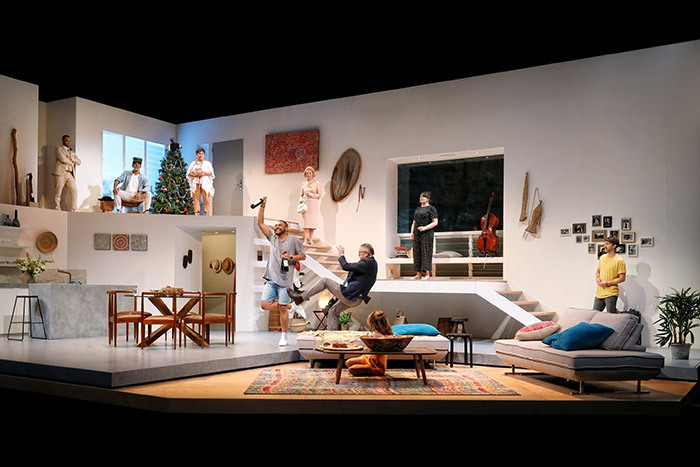 Lucy Prebble's play The Effect had its Australian premiere in this production directed by STC's Resident Director Sarah Goodes. 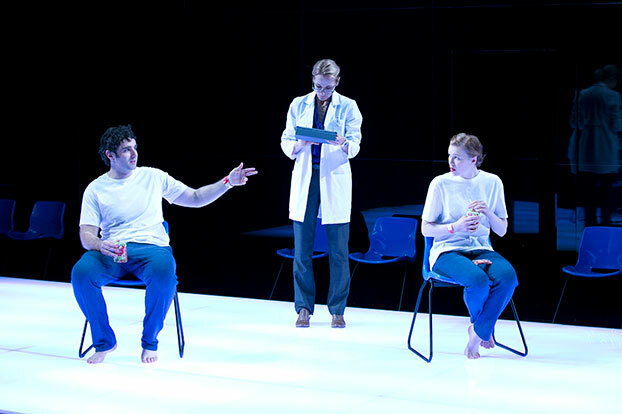 The play, which takes place in the clinical environment of a pharmaceutical drug trial, raises questions about mental illness and the chemical basis of emotions, while also charting the budding romance of a young couple. 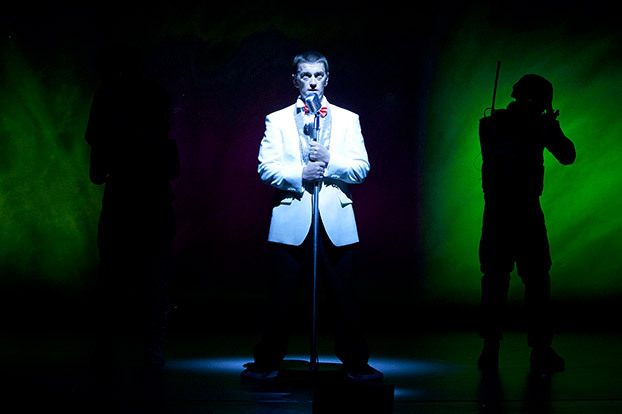 Renée designed both the set and costumes for this production, creating a strikingly bright playing space. Above, Mark Leonard Winter, Angie Milliken and Anna McGahan meet in The Effect. Below, it's not long before Anna McGahan and Mark Leonard Winter breach several of the drug trial's behavioural codes in one feel swoop. 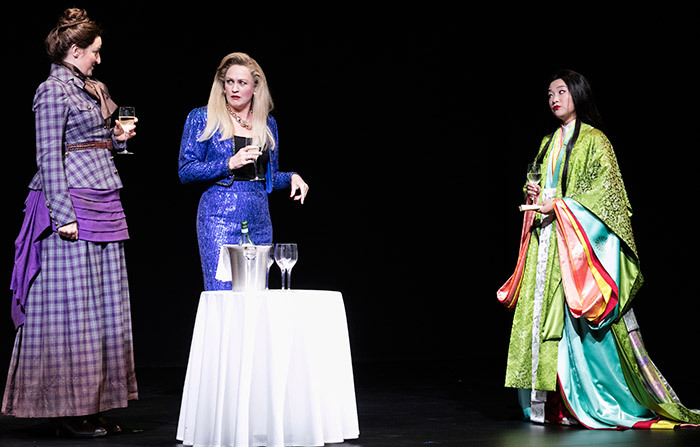 In Perplex, an existential German comedy from the pen of Marius von Mayenburg, Renée had the opportunity to design some very eccentric dress-up costumes for our Costumiers to create. 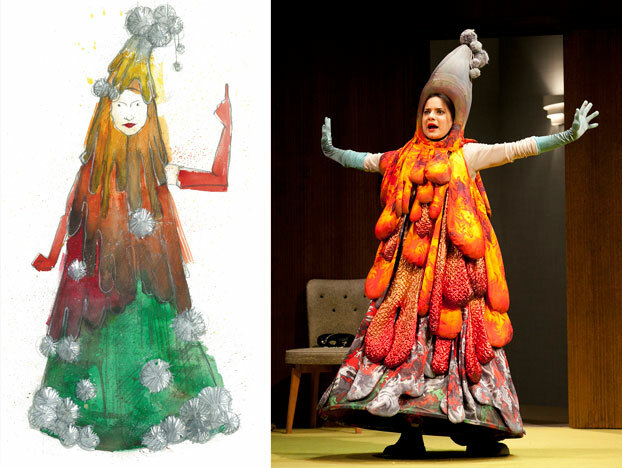 Above, Renée's initial sketch for the volcano costume, which Andrea Demetriades wears in its final form. And below, Andrea's volcano makes friends with her nordic neighbours, Tim Walter (elk), Glenn Hazeldine (skier) and Rebecca Massey (viking). 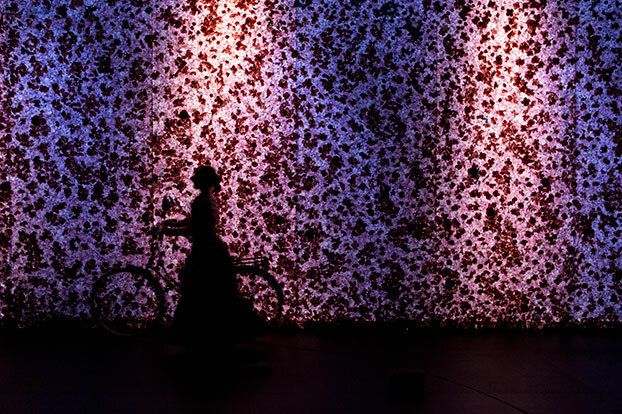 In this historic collaboration with the Australian Defence Force, Renée's set and costumes helped tell the stories of Australian servicemen and women dealing with the physical and psychological fallout of war. Above, Odile Le Clezio, Tim Loch and David Cantley, and James Whitney, below. George Bernard Shaw's play was directed by Sarah Giles while she was a Resident Director here at STC. Renée's period costume designs were balanced by the abstracted beauty of her set design, which featured an unforgettable wall of roses. You can watch Renée discussing the backdrop with our Head of Scenic Art Hilary Burrows in the video below, or scroll on for photos of the set in its onstage glory. Above, Renée's sketch for Praed's costume, the final version of which Simon Burke would wear onstage. Below, Helen Thomson in the title role with another of Renée's delicately crafted period costumes. 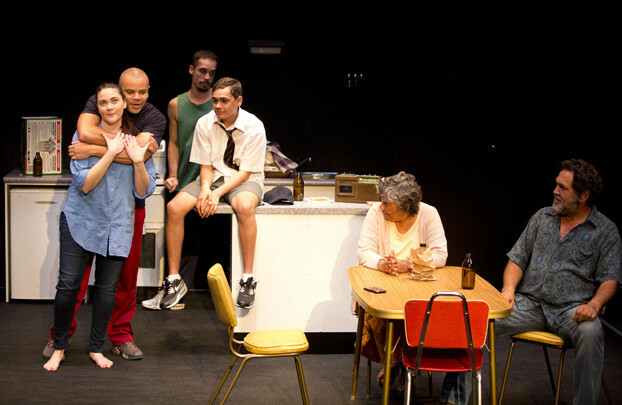 Kylie Coolwell's debut play, Battle of Waterloo, was set in one of that suburb's public housing towers. 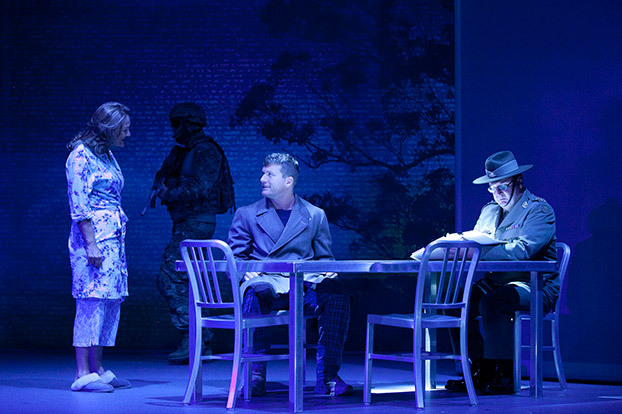 Renée designed both the set and costumes for this production directed by Sarah Goodes, featuring Shari Sebbens, Luke Carroll, Guy Simon, James Slee, Roxanne McDonald and Billy McPherson. 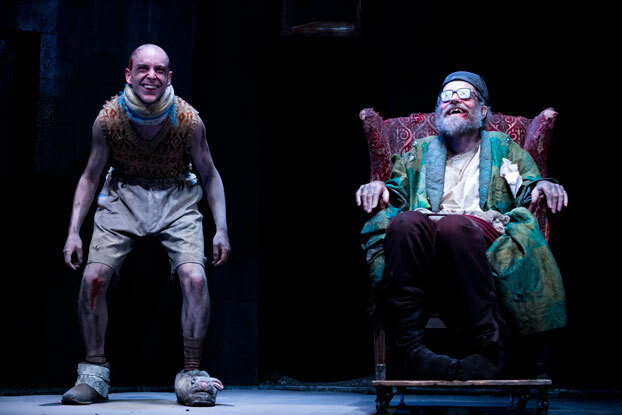 For Samuel Beckett's Endgame, directed by Andrew Upton, Renée created the well-worn costumes of Hamm (Hugo Weaving), Clov (Tom Budge), Nagg (Bruce Spence) and Nell (Sarah Peirse). 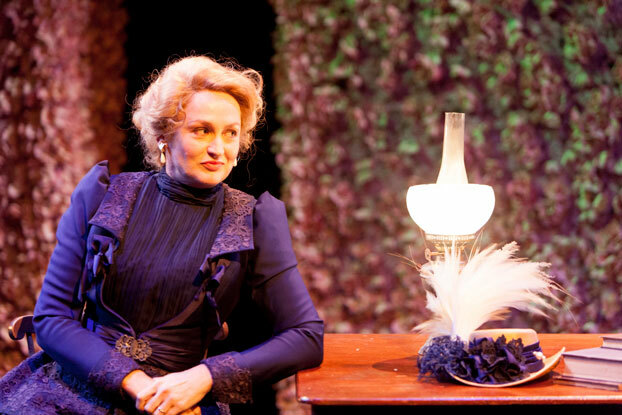 In the Sydney Opera House's Drama Theatre, Renée created set and costumes for an adaptation of Virginia Woolf's Orlando by American playwright Sarah Ruhl. 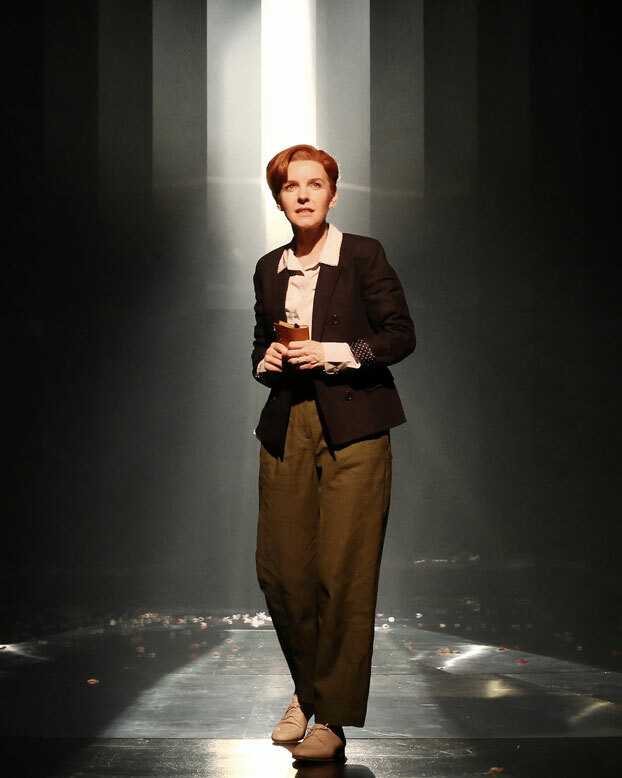 Directed by Sarah Goodes, the production featured Jacqueline McKenzie in the title role, with John Gaden, Anthony Taufa, Garth Holcombe and Matthew Backer amongst the other cast member. 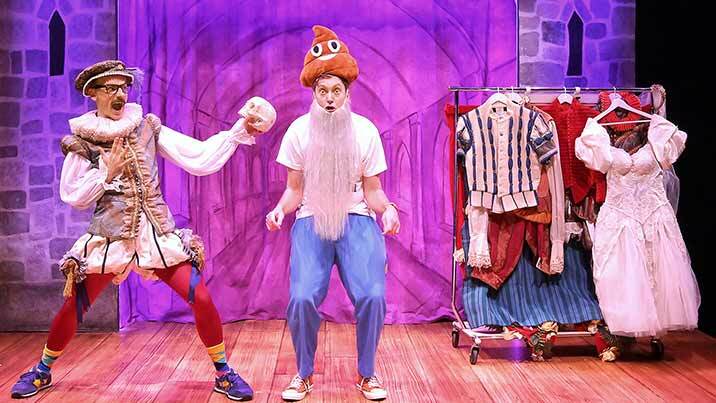 For this hilariously silly kids show, created by The Listies, Renée produced a cardboard Elsinore castle, a poo emoji hat for Poolonius and a ninja-nun outfit for Ophelia. And that was the serious stuff. 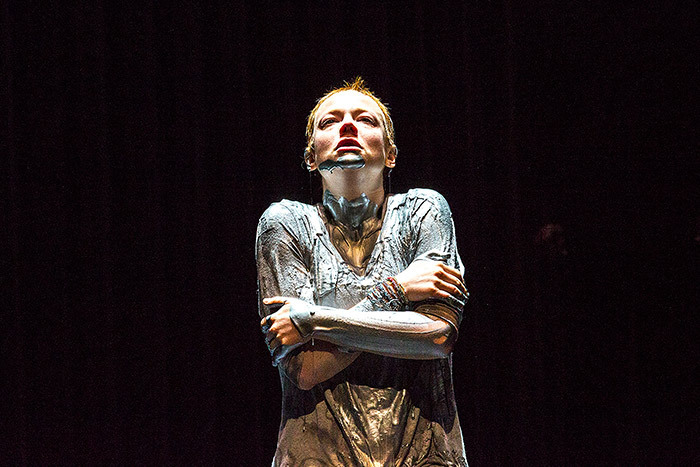 Lucy Kirkwood's play was given a sweeping production by STC's Artistic Director Kip Williams. Renée designed the many costumes for the 32 performers, with the total number of costumes ticking over 250. It was an epic undertaking which she spoke about in this podcast. 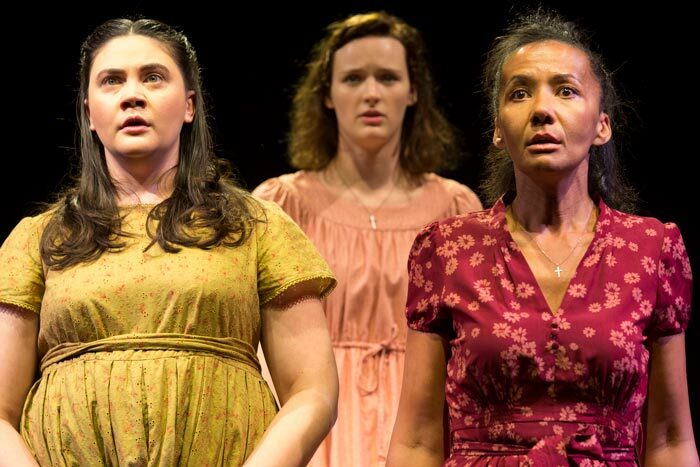 Originally produced by Griffin Theatre, this powerful, award-winning play takes us through the aftermath of three women's revenge against the abusive man of the house. 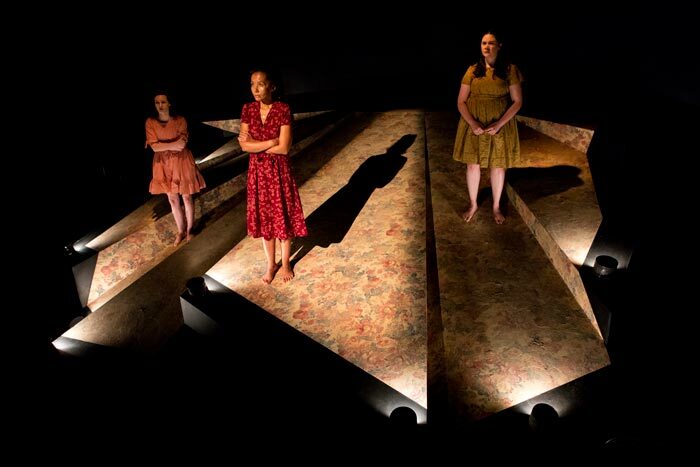 Renée's set and costumes placed the actors (Paula Arundell, Airlie Dodds and Shari Sebbens) in an abstracted, timeless version of the play's Australian rural setting. Top Girls is Caryl Churchill’s whip-smart, funny and deeply moving classic featuring famous women from history, literature and legend. Renée’s costume designs spanned from the 9th century right through to the 20th century and landed in the early 1900s, all featuring details which highlighted the very different paths and experiences of these women. 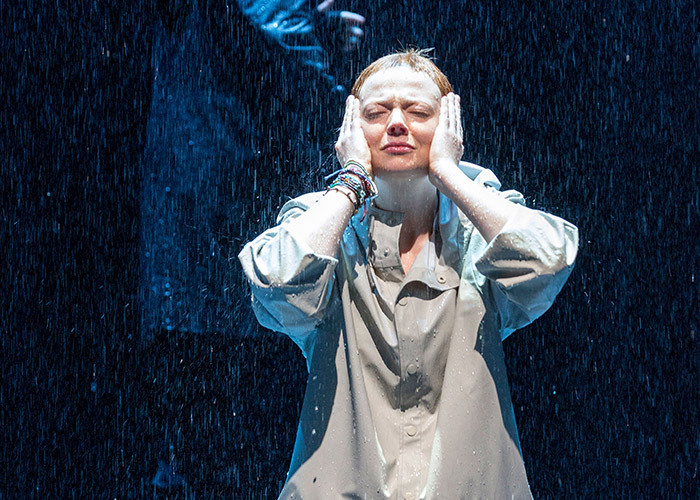 This new, modern interpretation of George Bernard Shaw’s dynamic classic was directed by Imara Savage and brought to life on stage by the luminous Sarah Snook. David Fleischer’s fast paced set design complimented Renée’s dynamic Joan costuming and made for riveting political drama. 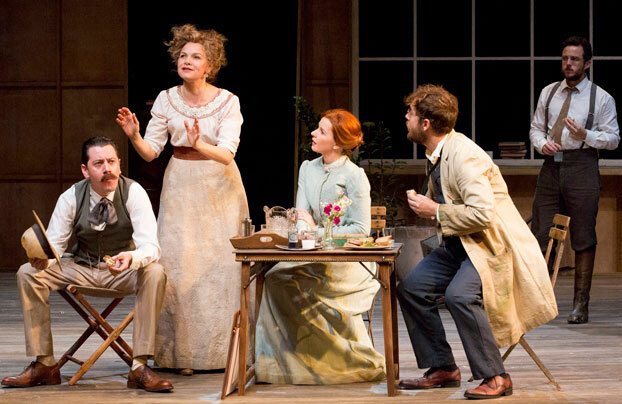 Written by Ruth Park and adapted for the state by Kate Mulvany, Harp in the South was a landmark event for Sydney Theatre Company. 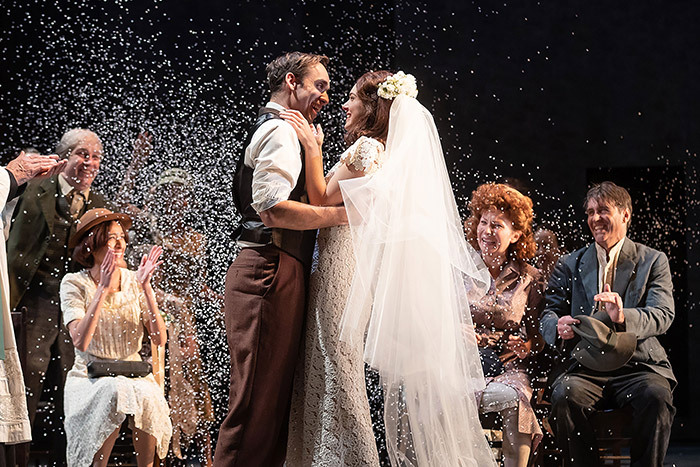 Running for over 6 hours and including over 80 characters, Renée’s costumes beautifully detailed a boisterous and changing Sydney across three decades from the 1920s through to the '50s. Production photographs by Brett Boardman (Children of the Sun, Mrs Warren's Profession, Chimerica, The Bleeding Tree, Top Girls, Saint Joan, ), Lisa Tomasetti (The Effect, Perplex, The Long Way Home, Endgame, Battle of Waterloo), Prudence Upton (Orlando, Black is the New White) and Daniel Boud (The Harp in the South).